Thank you! Loki’s relationship with Sigyn is never expanded beyond what happens after Balder dies. She and the one or two kids she has with Loki are just suddenly there. Perhaps there were other myths where she was mentioned more that are lost to us now, but I don’t mind terribly because that gives me license to write her as I like. In TMK, its Loki’s relationship with Angrboda, the mother of the monster babies, that is most certainly strained. Awww. Loki and Sigyn smooching is going to be making me smile until next week. The boys are just giggle inducing; my nephews (though much younger than Loki’s kids) are at that stage where anything mildly romantic is gross to them. And then you get down to Coal in the final panel and you just feel sorry for him. He needs a hug. Perhaps I shall fanart him getting a hug…. Aw, poor Coal needs a HUG. My little cousin was in that “EW ROMANCE” phase up until fairly recently, and I remember when any movie with a kiss in it had my brother covering his eyes and going “EWWWWW” as if someone had been violently murdered and then chopped to pieces. /I/ think Loki and Sigyn are cute! So there, silly little boy-children. Ok, this may seem random but I really love how each son has one parent’s hair color and the other parent’s hair texture. Details! Hahaha! Yeah I almost gave them the exact same color and style as one of their parents but decided to change it a bit. Thanks! Loki and Sigyn are so perfect with each other! <3 I mean, they'd have to be, but still. Haha. Yeah Coal’s probably feeling a ton of different things. And I’m glad Sigyn creeps you out. She’s supposed to be less cuddly-ish than the others. :3 Thank you! Wow, my first reaction when I saw the “Next” button: OH MAH GAAAAAAAAAAWDS. Haha! Oh she goes very well. ;D Thanks! I’m glad you’re excited! I just hope it’s enough to stick around for a long, long time. XD;; Thank you so much! ..and maybe I know what creeeps you out, Cloud? Sigyn in that big pic looks a bit like a grey alien because of her eyes? Poor Coal, I so feel for him. i wonder who coal is missing, his mother, or someone special? first panel is just awesome! Had to stifle a giggle at the boys “eww”. And poor Coal. Remembering his own parents? Maybe! It’s hard to know what goes on behind those little gray eyes of his. Oh man, adore Sigyn’s design. She and Loki are too adorable *g* OKAY THAT PRETTY MUCH SUMS UP LOKI’S ENTIRE FAMILY THUS FAR. And n’aww, Coal. Boy needs a hug. Haha, thank you! XD Adorable is always good. Dont recal much about her aside from keeping snake venom from dripping unto Loki. Heh be interesting to see what you do with the character, especially being the wife of a trickster shape shifter. 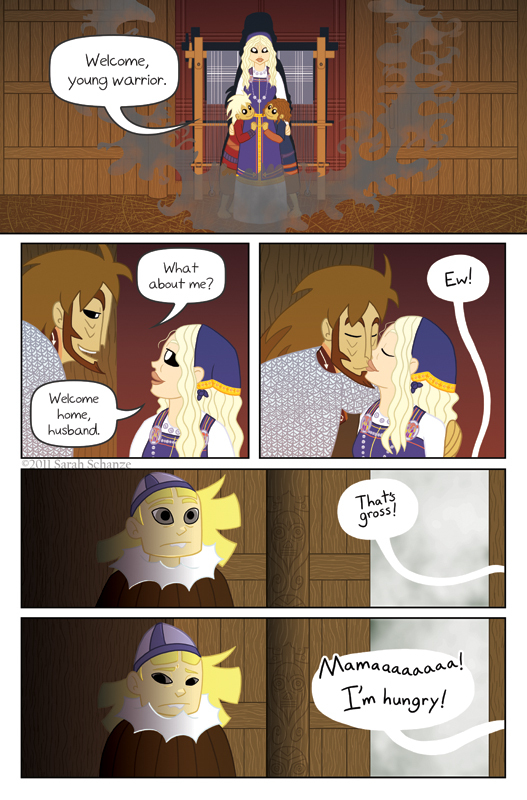 Well, can I just say I absolutely love this webcomic! Great art, gorgeous story chock full of Norse mythology refrences, wicked interesting characters, regular update and the expressions. My god the expressions are so wonderfully brilliant if you just posted them and nothing else I’d be happy. I’m loving how you’re portraying Loki as a family man, I can see why he wanted Coal to live, is it because he wanted him to have a loving family and home like he has? I love Coals expression, is it because he knows he won’t be able to have a family like this? Eagerly awaiting the next page! Aww, I’m glad you’re liking the comic so far! I’m afraid I can’t really answer your questions though, because that would spoil things. :3 Thank you! Just writing to say that I really enjoy your comic and wish you best of luck with it! Did Coal have someone special? Coal had a lot of special people in his life. Someday you will meet them all!